Conservative is how I am going to describe my immersion into the art of weaving. 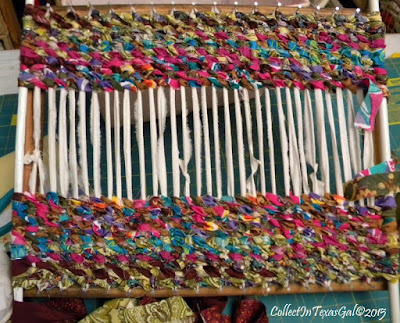 It isn't that I haven't any experience with weaving...I did a few classes in college and I taught basic weaving to my students while teaching art at the junior high level. 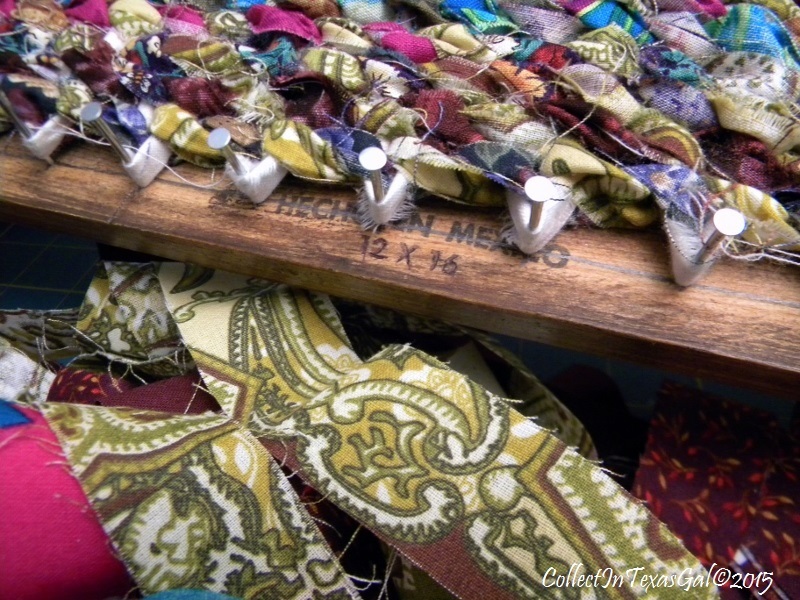 Over the years I have incorporated weaving in other mediums done as a student, teacher and professional artist. 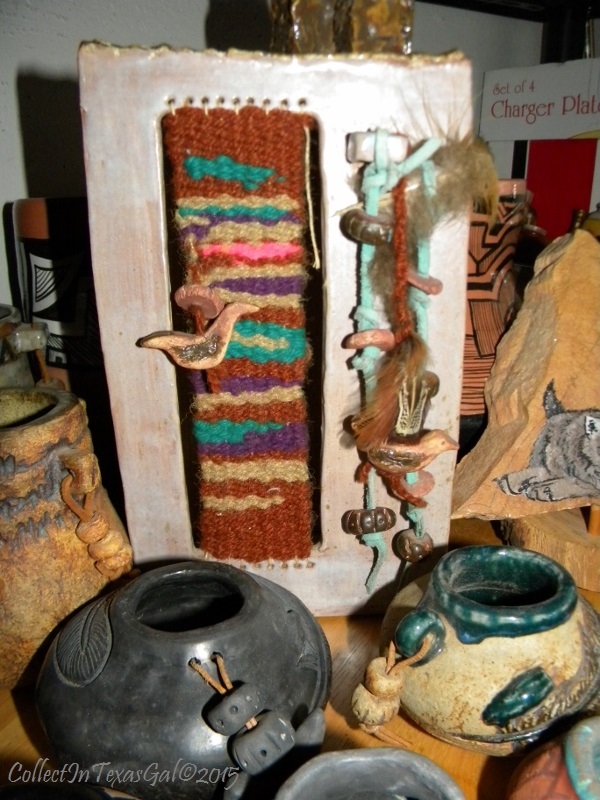 During my Southwest Period, fiber found it's way into pottery pieces. The influence of Navaho weavers, their history and craftsmanship for developing wool from sheep to fiber became an integral part of several mixed media art pieces. Still today, the colors and designs continue to influence choices I make. In many ways, the Southwest influence will always be a favorite for making jewelry, clothing, and art. I always thought I wanted a large 'Floor Loom', but space and commitments to other 'Art Forms', and jobs took precedence. 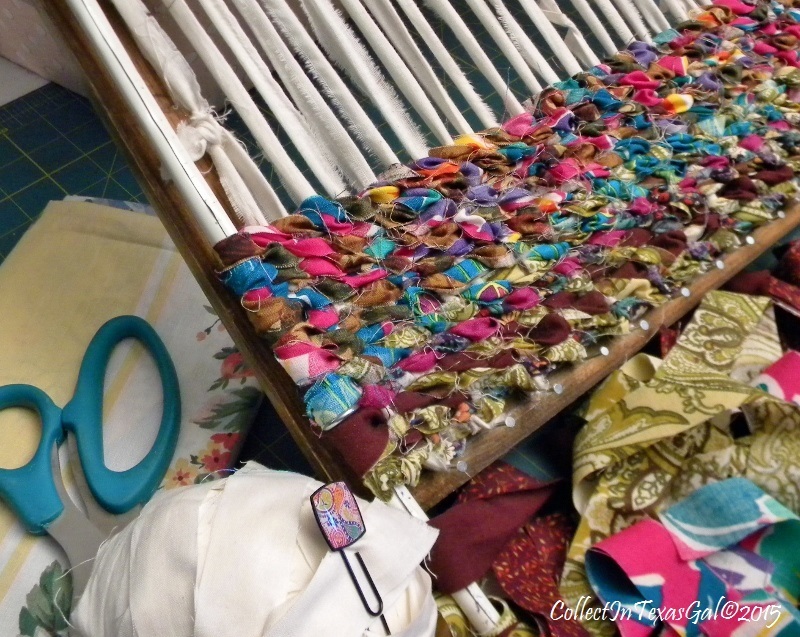 Now, I am over the large loom and all that it entails...which is a lot. I am now more interested in the weaving of my pioneer ancestors. They were weavers of cloth for home and hearth. So, it is safe to say that repurposing fabric scraps, old clothes, sheets and more into rag rugs and other home and hearth items is built in to my DNA. However, much to my surprise, I have taken a rather conservative approach in starting another 'Fabric Art Form' even though it is of great interest to me. With this basically new interest, I am starting small with a home made loom. Yep, it is a repurposed picture frame with the warp being held in place by nails and the weave secured around curtain rods. The rods are an important part of the loom when weaving in the ancient art of 'Twining'. I am drawn to this weave because it covers the warp completely and creates a more interesting texture than the typical over and under style. 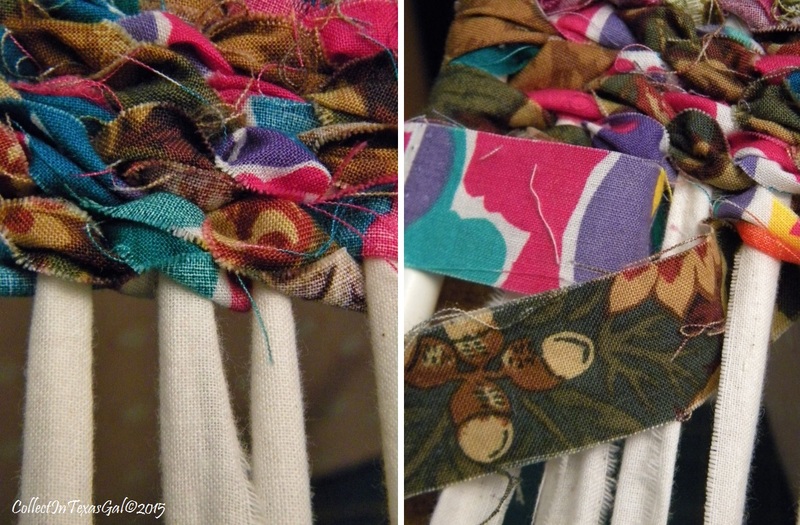 I also like the way it changes the patterned fabric strips as they are woven. 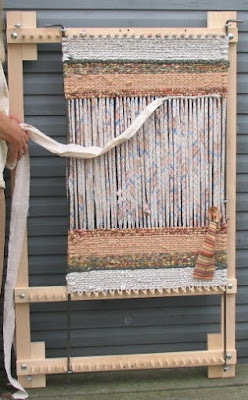 So, are you wondering when I will make the jump from a 12x16 repurposed loom to a honest to goodness real 'Twining Loom'? is on it's way to Texas. It's a 'Loom Dream' come true. Very cool, Sue! You can do everything, I think! Yup, I pretty much give everything a try. One of these days maybe I will settle in on one thing....NOT! I bought some woven placemats in PA years ago from an Amish/Mennonite shop. I wonder if they used that same kind of loom. They may very well have used a loom much like this one. I have seen some Amish weavings done on the large floor looms as well as small lap looms. Their craftsmanship in all handwork is incredible. I would love to visit PA someday. Ahhh yes...you would know about the state of PA. I can just imagine how beautiful it must be this time of year, and a visit there would definitely include the Amish country. 'Kit Looms' are making a come back in the craft world. There are all kinds from the potholder loom to knitting looms and more. 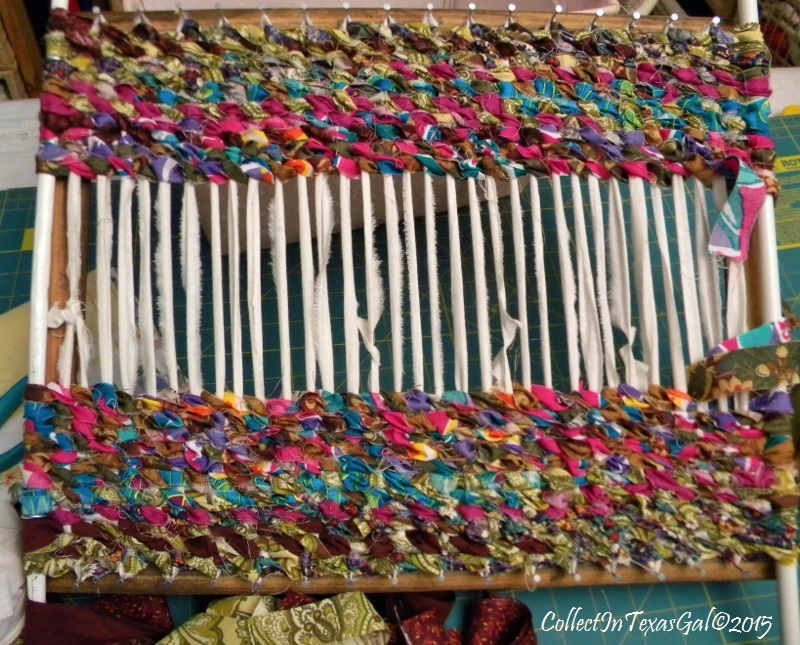 I remember weaving potholders for my Mom. She was always so encouraging to this 'I need to create' kid. Weaving is one of the things that I want to try. Our youngest daughter has a tabletop kind of loom, but I haven't a clue where to start with it.